Being a published book author is the best way to show your authority and expertise. But how do you go from concept to text to design to launch? Get the answers straight on this episode of SuperFastBusiness. 01:35 – Why publish a book? 05:50 – How long does it take to publish a book? Change how people perceive you. [Click To Tweet]. Baby just arrived! [Click To Tweet]. James: James Schramko here, welcome back to SuperFastBusiness. Today, we are on the subject of publishing your own book. I know we’ve covered this before on SuperFastBusiness, we have had a couple of posts. John Carlton shared how to publish your first Kindle, with getting out on that digital marketplace on Amazon. And we also had how to go from zero to bestselling book in three months. And both of these posts were very popular, which is why I thought it would be a good opportunity to speak with a friend of mine, Jon Hollenberg, who’s just published a book, and I wanted to go through some of the stages that Jon’s been through, and just see if we can pick up some more ideas on this topic, because I really think that if you want to position yourself as an authority, at some stage you will be publishing a book. I’d love to welcome to the podcast Jon. Jon: Thank you, James, for having me. James: Jon, you’ve got a new book out, it’s called Love at First Site: How to Build The Website of Your Dreams. You are a web designer. Basically you’ve been doing this for a long time. Jon: Yeah, almost ten years. James: OK, so you’ve got all this information, you’ve thought, “I’m going to publish a book.” What led you to decide on the process of publishing a book in the first place? Just why did you do it? Jon: Yeah, a good question. As you probably well know, the web design/sort of online space is a very crowded one, so I was really looking for a way of differentiating myself. The more that I do this, I realized it really is an authority game, and most big authorities, they’ve all published a book. So I set that goal for myself, about 12 months ago, and I’ve just previously taken delivery of my new book about a week or two ago. James: Now I’ve been following this. I received a copy of the book, thank you very much. James: I even got a mention somewhere in it, which certainly didn’t hurt your chances of getting it promoted by me. Jon: Well, you’ve been a big influence on me. For many years I was part of your SilverCircle mentoring program and came away with immense value from that and you’ve really helped transform my business. So I‘ve got you to thank, James. James: Well, I appreciate that, and I know you’ve come to at least three of my live events, and I love watching your marketing, and I know you’ve built some sites for some big players. You’ve got, Small Business Big Marketing is one that I noticed you were working on with Timbo Reid. So you’ve certainly got a super successful business, a decade’s worth of knowledge, so I get the why. It’s time to put a book out, good marketing piece. How do people see an author? Already in the very first stages of publishing the book, have you noticed a change in the way that people perceive you? Has it had a payoff yet? Jon: Yeah. Well, they say that your, apparently your IQ doubles the second that you take ownership of your book. James: It’s like buying glasses. So in terms of physical, tangible results, I had a bunch of proposals out, and when I physically got my book, first day I sent a copy to two people, which the sales process had stagnated. Within a week they were ready to proceed and I’m working on their projects now. So just in the short two weeks since, it’s had a great impact. James: So it’s got the business card effect. It’s like the ultimate business card. James: Now, let’s just talk about the book itself. I mean, this is actually a real book, and I say that in the kindest way to people who have what I would call, like, pamphlets. I’ve seen a trend lately, and I’m not saying it’s right or wrong, but I’ve seen a trend where people are just having something transcribed off a conversation, they’ve published a book very quickly, and it’s somewhat underwhelming when you receive it. They’re not quite as big as your book, not quite as thick. And they say it clearly in the cover, you know, this is just meant to be a guide or whatever. But what was the reasoning for you to go for an actual, substantial, quality sort of book rather than the trendy, transcribed sort of pamphlet-y book that people publish? Jon: Yeah, so, as I said, it’s that thud factor. It needs to be significant, it needs to feel like a real product that you would actually go to a bookshop and buy. So that for me was very important. We are graphic designers, so it had to look great, and I actually went through our logs, there’s maybe 1,500, 2,000 hours devoted to this, from illustration, writing, typesetting, promotion sort of standpoints. So there’s some blood, sweat and tears that have gone into this. James: How long has it taken from when you first started to when you published? Jon: Ten months. So I did a 30,000-word writing challenge, first of December, 2013, and wrote a thousand words a day for 30 days. And that was a rough and ready manuscript, at the end of that 30-day period, but essentially I got it out. I got it out of my head, and had it out on paper, and I was able then to refine that, so I can get into the physical process, but yeah, it was written in 30 days. James: Right, so there’s a big lead-up period. You wrote it fairly quickly, you spent a ton of time on design, and it really bears pointing out: you are a Web designer, if you’re going to be selling a website for 10 grand, then your book’s going to have to be well-designed. And I will say that this is probably one of the best-designed reading books that I’ve ever seen. You would expect this to have a hardcover, coffee table size for the quality of the design inside. I mean, this is the same sort of quality of the fonts and the pictures that you would find in coffee table books and illustration books, and that’s because of what you do. So it actually feels, tactile-wise, the cover and everything’s high quality. And it’s got a $30 price tag on it, too. Is it more expensive than normal books? Jon: Good question. I wrote this book as part of a facilitator program, who guided through this process, and the mentor in the publishing phase, he really encouraged us to set a good dollar value, so it puts worth on your work. Because if you don’t, then people don’t value that, so it’s a good filtering mechanism, and when you do give it to someone there’s a high perceived worth. But yeah, the book is actually a physical product that’s for sale. James: So is it fair to say, you’re not really doing this to sell as many books as possible and make all the money off the books? James: This is to sell websites, and to sell Jon Hollenberg? Jon: Correct. Exactly. Yes, yeah, I ideally will be selling some good $10,000 websites out of this, so essentially this is, like you said, an authority and a marketing exercise. James: OK, so we’ve talked a little about what the book is. We’ve just started the conversation on how you do this. Now what if you don’t have a guided writing mentor? What if they’re just listening to you right now, what would be some of the things that we should talk about? I guess if I were to jot them down you’d be thinking about the idea behind it, the book outline, like what are you actually writing about. And then we’d go through the actual writing phase, and then I imagine you have editing and then formatting and then launching, something to that effect. So why don’t we start with the idea – Why did you go for this particular topic? Jon: Well, it’s obviously something that, after 10 years of building websites, I know a little bit about. What I really wanted to do was to give the average business owner or CEO an overview of the sort of mindset and the strategy that they need when they engage with a company like us. So everyone likes to be informed, they want to know about the process but they don’t necessarily want to do it. So this book’s not for someone who can go and hack together their own site. It’s more about getting the bigger picture so that they’re well-informed and educated through that process. In terms of coming up…You’re a big planner, James, that’s something I really learnt from you. So what you want to do is create a book pitch. And you really need, I think the central question, what is the one central question that the book answers? And that gives you that laser focus so that when you sit down and write that book, that’s the one question that you’re answering in every part of that. James: So what question were you answering? James: Right, so this is where, I mean there’s so many things to talk about in online marketing, like everything. There’s the part about your business around the website, there’s the website itself, there’s the website in minute detail, like there’s the technical side, there’s the usability side, there’s the SEO side. Then there’s after you’ve built the website, you’ve got traffic, and you’ve got your testing, and all these others. And there’s definitely books out there, like Don’t Make Me Think, and any number of traffic books. So I think what you’ve done is create a “How To Buy A Website From Me” guide. James: And what you’ll be getting and all the reasoning behind it so we can spend less time discussing it all, just read my book and then pay the invoices and everyone’s happy. James: It’s very clever. So if you’ve decided on the pitch, you’re answering this one question, and I suppose you have it emblazoned on a post-it note or a whiteboard in front of you, and you get into the writing. Any particular techniques or tools? Do you use cards or software, what’s the go with that? Jon: Well, you’re big mindmapper, and that’s essentially what I did. So just going back to the book pitch, we were very much encouraged to have a picture of the ideal customer, a person that would be physically reading this book, and you physically print out a picture of them, and they are the ideal person, and they’re sitting above your desk. You’re looking at them every day, as if you were writing to them. So you’re really clear on that. We did some more research around what makes the book unique, you define the target market, what are the problems that you’ll actually be solving for the reader, what’s the ultimate benefit. You look at the competitive landscape, who you’re actually up competing against. And then we drafted a contents page, which essentially maps out each of the chapters and the key subjects that you’ll be covering off. So we did that in a mindmap format, and it’s really about just having those bite-sized chunks that you can go in every day and just cross off your list as you write. James: Beautiful. So it’s like having Wilson from that Tom Hanks movie. Now I imagine your avatar might have been called Steve? Jon: Yeah, so I wanted to make this very relatable to the average business owner, and instead of using specific case studies, I used this fictional character. He’s called Steve, he’s a building draftsman, so he makes technical drawings for buildings, like an architect, and he’s your average sort of professional services business owner. And I really channeled all our clients’ experiences over the last 10 years into Steve’s journey from formulating a web strategy, how to actually go out and partner and appoint a website designer, what platform and tools that Steve should be using, the importance of design, so just giving some fundamentals around design, the importance of content, so obviously having that market authority and content creation mindset on his website, so it’s not set and forget. And then optimizing and really having a technical checklist for that. So Steve really, he’s there every step of the way and he illustrates that process in a storytelling sort of manner. James: And did you start at the beginning and work your way to the end? Did you follow the mindmap that way or did you attack bits in different order? Jon: No, it was, yeah, it was a bit more what do I feel like writing about today, and there were some subjects that were more interesting than others, and some certainly more difficult. So it was just, and look, books don’t need to be written in a linear fashion, it’s just putting all those pieces of the puzzle together but making sure you’ve got the bigger picture so that it flows through. James: Did you use any particular tools, or you’re just sitting there with the computer and Word document? Jon: Just sitting in Google Docs, literally just punching it out. I mapped out the main chapter headings, and then it was just filling the gaps. James: Right, so that’s pretty cool. I got a nice tool from a friend of mine, Andre Chaperon, that’s good for writing, and it’s an app that I put on my Mac. And it sort of closes everything else out, and I’ve found that it also seems to work well with the dictation feature. It’s called iA Writer Pro. Jon: Is that one where it, say, shuts off your Internet, and… ? James: Yeah, it can basically take over your whole screen, but it’s really built for just writing. And I’ve been drafting long blog posts in that as a tool. It’s been pretty handy. James: But I imagine with Google Docs it’s pretty cool in regards to its ability to save. I can imagine losing your work would be one of the biggest nightmares you could ever face. Jon: Exactly, yeah. So that was drilled into us and every day I just emailed myself a copy of the Google Doc and emailed it to my wife and just made sure there was copies of copies of copies. James: We’ve all lost work. James: And a lot of listeners would remember my product Traffic Grab. And I built up the first slide deck version of that, got up to about eight hundred and something, it was so many gigabytes, and it crashed, and I had to rebuild many, many slides. I almost didn’t do it. I’m glad I did do it, it’s probably what made it good in the end. It was the fact that I was so resolved to get it out there. How many times during the process did you get tormented or challenged, or think, “Screw this, why did I do this?” or “This is hard work,” or have doubts, “Maybe I’ll put this out and someone’s going to think I’m a fraud,” or whatever? Jon: Pretty much until launch, James. James: It really is a strong feeling, isn’t it? Jon: Oh, unbelievable. I actually wrote a blog post about it and it’s just… There’s something about putting your work out into the wide world, and that fear, that voice in your head that essentially you just need to beat down and forget about, really. And it’s such a liberating feeling when you actually do get great feedback out there that you have created something that’s helpful and worthwhile and that people actually value. James: Yeah, and I think when you got your box of books, I think you said something like, it’s like your baby’s just arrived or something. James: The only difference between the book and the baby, like one of the big ones, is with the baby you can’t stop it coming. It’s coming out at some point, it’s just a matter of time. With the book, though, as authors, we can tend to kill off our work for a while and hold back. So we have to be guarded against that. So let’s imagine we’re now up to the point where you’ve written it in Google Docs, you’ve emailed it to yourself every day, it’s backed up, you’ve got a solid pitch and plan around which gap in the market you’re filling. You’ve written it for Steve, just this one avatar who represents the majority of your customer base. It’s now time for editing, and I believe it’s a pretty important process in putting a book out. Jon: Correct, and I’ve really tried to do this professionally. So it’s self-published but at the same time, we’re mimicking the process that a traditional publishing house would go through. So I engaged an editor in Sydney and we went through that editing process. There were probably two or three edits and that took maybe 2 months, there was a full proofread down as well, so I got an external proofreader. So basically, you get a Word doc or a Google doc that you’re completely comfortable with and then you move into that typesetting phase. So we engaged a traditional typesetter, someone who is very savvy in design and they essentially layout the book, which is the next phase. James: Right. So tell me about the formatting. Jon: So with the formatting, essentially we gave them a full manuscript and we heavily illustrated this as well so our graphic designer within the business had been dividing time to illustrations about 150 illustrations. And that sort of ties into, I wanted to make it very visual. I didn’t want to make it like a traditional book that your eyes glaze over. I wanted someone to actually want to pick it up and flick through it and look at the great diagrams and understand visually the concepts, and hopefully have a few laugh out loud moments at some of the quirky illustrations and and all that sort of stuff. So I spend a lot of time there. Essentially the typesetter pulled it all together into a nice, tight package that was ready to be sent off to a traditional printer who does the printing. So literally 2 weeks ago, 500 books walked in the door and I’ve been sending out copies to friends and mentors and clients and all that sort of stuff ever since. James: Right. And you’ve put throughout the book lots of resources and stuff people can download, like the download of the framework that you would give your web designer. Like basically what you’d like someone to give you, you give them tools to pre-fill out, which I imagine would be very useful for your customers. How hard was it for you to join up all the links in there and how worried were you about things going out of date, for example, like when you link to WordPress plugins and stuff. Some of those links will probably last a long time. And then other ones you’ve probably run through your own website domain, which is probably by far the best choice, right? Jon: Exactly. So you’re spot on, this is the Internet – stuff changes. So I’ll talk about the audio version. We actually have an audio version recorded, but essentially, there’s a bunch of resources that you can download. I framed it in the book that, yes this is the Internet – stuff changes. For the most recent version go to the site and download these resources which will maintain and keep up to date. So with the audio book, this was actually something that I’m a big consumer of audio books and podcast and that sort of stuff, that’s how I like to get my information when I’m driving or jogging or whatever. So I went to the added trouble of actually finding a professional voice-over person, who then converted the whole book into MP3 format. So he’s got a great voice, he’s very palatable to listen to, you can listen to him. I think the book goes about 2 to 2 1/2 hours. All the chapters are separated into MP3 files, and that’s given away 100% free on the site. So what I really wanted to do was just to provide that different modality for someone else to consume that content. James: Right. For reference, this is loveatfirstsite.net. James: That’s where they can get the download and you can listen to the book. Now, you also have this book as a Kindle. James: So digital download, which is going to appeal to a lot of our audience here, digital consumers. What’s required for you to format it for Kindle compared to having this physical book? Is it much of a process? Jon: Not at all. And that was actually done by the typesetter who did the physical print typeset. James: They make two versions. Jon: Yeah. From InDesign I think they’re somehow able to export the .mobi file, which is the native Amazon file. And they provide you with a funnel file output. Amazon has done such an unbelievable job in terms of making self-publishing easy. So I literally have an Amazon account, I signed up for the Kindle direct publishing direct account, and essentially I was able to upload that .mobi file and a title image, so a cover image, and you also put up an author bio and a little bit about the book, and within 12 hours, the book was available for purchase on the Amazon Kindle system. James: I think you mentioned to me you followed some of the concepts from the “How to go from zero to bestselling book in 3 months” post with James Roper. We did an infographic talking about Kindle direct publishing and then the promotion and stuff. Where are you up to in your promotion and how has that been going for you? Jon: Yes. So part of the KDP program is you’re able to have a free period. So I’m in the middle of that. The book has been downloaded, it’s been free for the last 36 hours, it will be available for 5 days for that free period. It’s been downloaded over 2,000 times in 36 hours. So Amazon is an absolute traffic weapon. So as you mentioned, I provided the audiobook version. There’s an opt-in at the start of our book which references that. So people can get that audiobook version in exchange for signing up. They just have to hand over their email address and it’s actually building quite a substantial list now. I’ve had, just in 36 hours, maybe 400 people opt-in for that, to receive the audio book. So there’s some really good numbers coming out of it. James: Right, well yeah, it is phenomenal. Just to put that in perspective: It would take me almost 2 months to get 2,000 downloads of my free course on my blog. So tapping into Amazon is clever, something I’ll be doing for sure. It’s such a huge marketplace. Jon: Yeah. I never had expected it either until I launched, and then it’s just growing and it gets momentum. It snowballs, so once you get in their favor and their algorithm kicks in. I think the book’s sitting in about 165 worldwide for free Kindle books at the moment, and as people download it more, it keeps growing. So stay tuned. James: Yeah, well good luck with that. James: So what about the physical book? What are your plans with that? Obviously you’ve sent it to some of your prospects. What do you do with it now? Jon: That’s a good question. So I’ll actually be having a physical book launch at the end of this month and that will, you know I’ll invite, say about 50 of our clients and friends and family and all that sort of stuff. Just to have a bit of a celebration because as you’ve said it, it’s like giving birth to a third child. It’s been a great process and it’s been a big part of my life for years. So just a bit of a celebration. And then really just try to get it out to a lot of influences. So aspirational people that I guess without the book, it would be maybe difficult to get in front of or get noticed by. So I’ve really been strategic about trying to send copies to the book and really approach it from a partnership angle in terms of maybe heads of associations or whatever, where I can add value to their member base. James: Right. And so it’s quite strategic for you to mention people in the book. You’ve got a few pages in there, you’ve kind of got a directory of influences, so I imagine that the flattery technique will get you some good leverage in your immediate community. Jon: Yeah, correct. Look, there’s an element of flattery but it is really about giving back and saying thanks and also that the information containment within that book is a combination of all the advice and help over the years. James: Now just in terms of costs in printing and distribution, etc., do you have to pay for a huge quantity upfront? Do you have a garage full of these things? Jon: I ordered 500. You can do a minimum print of around 250. So average, it cost me, I think it was around $6,000 for the 500. This was a bit more of an expensive style to books. James: No doubt. And it has all sorts of colors in it, it’s thick, it’s high quality. James: But let’s put this in perspective, for a Web design business like yours, that’s a tiny business expense in the general scheme of things. The costs of running a business like yours and mine are much higher than what people sitting at home doing hobby businesses would be spending. So $6,000 for someone who’s got a blog sounds like a lot, but for a business, that’s really just an expense, it’s tax deductible, it’s a marketing cost. And you know, you need one customer and you’re back in the block. I’m sure you’ll get a few. Jon: Yeah. There are other expenses like your editor and the audiobook recording. But all up, I think it was about $15,000 exercise. James: Right. And it’s no doubt you’re going to get it, generate a ton of business from it. Have you been invited to speak on platforms or anything like that, as a result yet? Or have you got yourself some high-level media gigs? Jon: That’s really what I’m pushing toward now, James. And that’s part of the authority building process and certainly, calling yourself a published author helps in that regard. And it also gives you another product for those prospects to sell from stage. So it fits so perfectly into the whole ecosystem. Jon: Yeah, and that’s actually another thing that you instilled in me, is really just to get it out. So it’s funny you mentioned that because I sent the book to a friend in Sydney and she’s actually been SMSing me all these typos that she’s found and she’s obviously got a keen eye, even after 4 or 5 proof reads, and so many people looking at the book, there’s maybe 4 or 5 mistakes in there. And that’s cool ’cause I knew that I had to draw the line somewhere just to physically get this thing out; otherwise, I would still be editing this manuscript. James: Yeah. I mean I haven’t published my book yet, but I do have an Evernote on things that I want to change or add to the first second draft of it. So your book’s published, mine’s not. Jon: I’m looking forward to it James. You’ve been talking about this for a while. James: It’s there. It’s like the greatest secret ever. It’s not that I’m scared of it, it’s just that I haven’t felt that the time is right for whatever reason, but there will be. I think next year is my year. Jon: Do you have a title? James: I think it’s something to do, and before all these Malaysian Airlines started dropping out of the skies, it’s like a Blackbox Formula or something. You know, little things like that crop up and I think, hmmm… I wonder if that’s going to change the title. But definitely, what I’ve noticed is that every week on my SilverCircle calls, I usually come out with one key concept or idea that I think is just fantastic and I should put into the book. Like I find myself saying the same things like “Shake the tree.” People have been working so hard on setting up their business and building capacity and then they’re like, “All right, well now I need some customers, so we go and shake the tree.” I think Shake the Tree would be a really good story or chapter. And then another one came up yesterday, which is, a lot of people are building sandcastles and it’s better to build something that lasts a longer time. So I did a sandcastle theory and the analogy in this case was, the specific example is, so many marketers are sending sales email after sales email, whereas I’m just doing blog post after blog post, and then emailing a very short email saying, “I’ve just added an interview with Jon Hollenberg about putting your book out there,” and I’m building something for the long term. That means I literally can have a little bit of time away from the business but my blog posts are still out there; this is Own The Racecourse style. Whereas the emails that were sent are gone, they’re vapor. There’s no leverage or perpetuation in them. So they might have a high conversion if you sell in the email, but the good stuff is lost for eternity. So this whole shift into building for the long haul. And then of course, I really want to reinforce some of the concepts that since I’ve put in the book as a minimum viable product was sort of the seed of that book, I’ve been able to really prove and develop and mature, and then there’s some others that I’d like to pair off. So I think when I do release it, it’s going to be a better book but it has to be the right time. James: It’ll definitely be more like your book, a high quality book that I’ll be proud of rather than a pamphlet. That’s for sure. Jon: And we’ve been through the process, never before have the barriers to enter have been so low and there’s no reason why you would go with traditional publishing house. Jon: It’s just been so easy. James: And it should be said, I’ve already probably spent 10 grand on getting it almost to a stage of yours, where it has been written, it’s been edited, it’s been formatted, it’s been illustrated. The main problem I had was I was severely let down by the person formatting it. It was like at least a year behind the estimate. So it came down to supply choice. At the time I wanted to publish it, I was all ready for it. By the time it came back, I was busy with other things and I’d lost that momentum on it. So I think it’s important to line yourself up with good suppliers. And I know you actually listed your suppliers in the second page. Jon: Yeah. It’s about that partnership approach and it’s about that general sort of sharing. So I have no issues in terms of telling everyone who I used and promoting their businesses as well. James: Yeah, you’re good like that Jon. James: All right. You’ve really been generous, I’m going to put out some references here. So I’m speaking with Jon Hollenberg. 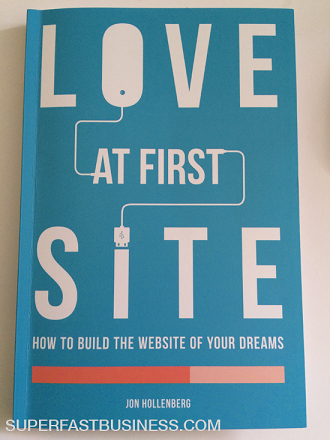 The book’s called Love at First Site: How to Build The Website of Your Dreams. First, I thought it was a dating book but then I figured out. Now obviously, you’ve used a metaphor there. And then on close inspection, you can see a USB cord and you’ve got the technology thing and a mouse, it sort of reveals itself after a closer look at it, it’s very clever. Loveatfirstsite.net is where you can get the audio download. You can buy this on Amazon. Can you buy the book on the Amazon as well as the Kindle? Jon: No no. I can take out that option and I probably will, but I think I need to ship a box over there. James: Yeah, you should do that for sure. The U.S. market is big. Jon: Yeah, yeah. It’s huge. James: So you’ll be able to get it on Amazon soon. You could definitely get the kindle. I imagine after reading your book, lots more people will be switching from horrible legacy beastie systems into a nice WordPress environment that will certainly look good. So Jon, thanks so much for sharing your book journey with us. Just to finish up on, how has it changed you? What’s the Jon now versus pre-book Jon? Jon: I think it is just 100% confidence booster. So you put yourself out there, you expose yourself, you become very vulnerable, and then you shift. And for me it’s about getting that validation, that feedback that I’m on the right path, that I’m doing great work and that I’m worthy. So that’s what it really comes down to. James: You are worthy Jon, it’s a wonderful book. I’d be proud to put my name on it. So if you ever feel like giving it up, just let me know. Jon: I look forward to your book James. Hopefully, we’ll have this conversation again in the next 12 months about your book. James: We will. Thanks Jon! Jon: Cheers, mate. Thank you! Awesome episode with Jon. I just bought the Kindle version.